Diamonds were first found in river beds in India in around 800BC. Since this time they have been treasured as precious and beautiful stones. 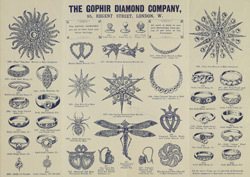 Diamond jewellery became very popular in the 19th century and items can be accurately dated by the way they have been cut. 'Rose', 'Brilliant' and 'Cushion' cuts were alternately fashionable during the century. Wealthy ladies who own very expensive sets of diamond jewellery would have imitation sets made from glass so that they could wear them without fear of loss or damage to the originals.